Please join us for our March meeting! This month we welcome Rinat Neal! Please join us for our March meeting! This month we welcome Dana Heisler! For March, we have the awesome Dana Heisler coming to speak from Jacksonville, Florida! In her program “Finding Your Inspiration for Entering Competition”, she hopes to inspire you to find a passion for personal creativity and to enter competition. She will go over the 12 Elements of a Merit Image and how she has created some of her art. This is not a photoshop class. Instead Dana will focus on design decisions that takes her images from camera to competition. Dana Heisler, M.Photog., CPP, is an internationally award winning photographer. In 2018 Dana was a Silver Medalist, an Elite Photographer, and named a Grand Imaging Finalist. She is competitive by nature but more importantly is passionate about continually learning and refining her craft. In her spare time, she enjoys digitally making new creations and working pieces of art for her collection. She pulls from these pieces for most of her competition entries. Don’t forget to bring your prints for print comp to get a point toward Member of the Year! Visitors are always welcome and are $25 at the door. Be sure to see Katie when you arrive! Bring a friend! This year we are changing our visitor policy and we’re very excited about it! Starting January 1st, you can visit our TPPG monthly meetings for $25.00 per month as many times as you’d like throughout the year! While we would LOVE for you to become a full-fledged member of TPPG, we understand that you may prefer to just visit from time to time. Be sure to keep up to date with our upcoming calendar so you can come to all the meetings you are interested in! We look forward to seeing some new faces in 2019! Please join us for our February meeting! This month we welcome Susan Torregrosa! 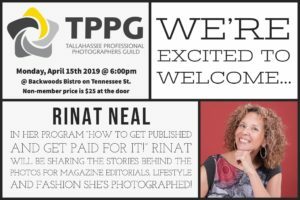 We’re so excited to welcome Susan Torregrosa to TPPG in February to speak on the MASSIVELY important topic of getting paying clients through your doors! Her program [MASSIVE] Action Required, Susan will help you define your ideal client, identify your brand, go over strategies for public awareness of your brand, create a system, and identify your weakest link. Create a brand that excites and always exceeds expectations! Susan T. is an internationally awarded photographer and instructor, teaching at all levels, including speaking on the Imaging USA platform. She holds several professional degrees including her Masters in Photography, Craftsman and she’s a Certified Professional Photographer through PPA. Don’t forget those PRINTS for Print Comp!